Players who prefer slot machines to other casino games do not gamble simply for profit, but they also want to have a good time playing. So in order to play the game for longer and benefit from your favorite slot games we recommend you to follow some slots tips that have been developed by experienced players. They will help not to lose at slot machines or online slots of different types and become a real long-term winner regardless the size of the bankroll. If you are going to visit a land or online casino to get the rush and thrill of slot machines do not forget to follow some basic slot recommendations. Even if you do not use any special slot machine strategies you can still end up a winner every time you gamble. So, below we explain some do's and don'ts when you play slots. 1. Manage your bankroll and stick to betting limits. 1. Try to win lost money back. 2. Bet Max at progressive slots. 2. Play high-roller slots with a small bankroll. 3. Choose loose slots with high payback percentages. 3. Believe in slots myths about cold and hot machines. 4. Look for extra slot bonuses and casino comps. 4. Play traditional slots with minimum features. 5. Study paytables and choose slots with the highest payouts. 5. Play at first slot machine you find at a casino. 6. Relax and have fun when playing slots. 6. Get frustrated or angered when you lose a spin. Now let's consider all the slots tips in more detail. The following advanced recommendations from the real pros are not obligatory but are considered to be the most effective methods of winning when playing online and offline. To built up a gaming strategy, the slot player must first of all decide on the bankroll and the size of bets. The smartest tips are to stretch the betting amount, pocket all the winnings, know when to stop and never try to win money back, because you can lose even more. Choose the slot machine according to your bankroll and betting limits. Remember, slots is a gambling game, therefore make sure you treat it wisely and choose a machine according to the amount of money you can afford to wager. Otherwise you risk to reach the "quit point" very fast. When playing at the progressive slot machines, bet the maximum amount of coins and bet on all the paylines. It will be a pity if you have the best combination but don't win the jackpot because you haven't Bet Max. Choose a machine with extra bonuses and special offers such as bonus free spins or bonus rounds. Such games are not only fun but also provide more chances of winning cash. 5. Play only loose machines. 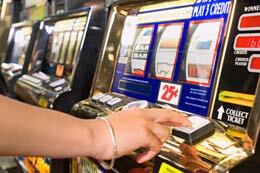 Not all slot machines are based on the same RNG, therefore always look for loose slot machines with the highest payback. Most casinos advertise the slots payback percentages. However, if you cannot figure out the payback statistics remember that as a rule $5 (or higher) slot machines provide the highest paybacks of up to 99%. 6. Practice slots for free. Before playing for real money, practice a lot in order to know all the game options and learn how to win at slots. You can try our free slots or play slot games in fun mode at online casinos. 7. Check the paytable before the game. Carefully study the slots paytable before you play to make sure that you know which combinations will win you money and to have an idea of what you are paid out for. Don't rush to play at the first machine you see but look for the slots with the highest payouts. 8. Don't believe in slots myths. Do not believe in the widespread slots myths. Don't forget that there is no such thing as a hot or cold machine, therefore pick the one you like and enjoy the game. Remember also that there is no 100% effective system of beating slots and any strategies offered you for buying are useless. 9. Benefit from slots comps. Most casinos provide casino comps for slot players in the form of free lunches and dinners, hotel rooms, tickets, bonuses, etc. In such way you can save money for playing rather than spend big sums on accommodation and meals. In case you have any questions about the rules, payouts, bonuses or other options, feel free to ask the casino support as they are there for you 24/7.